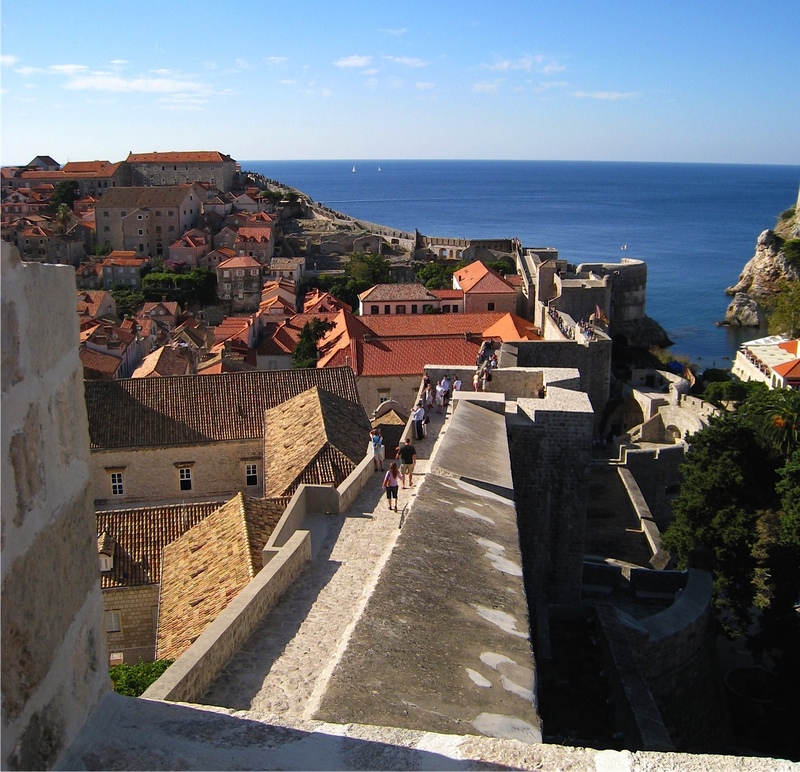 We woke to a warm, sunny October day and prepared for our morning trek on the walls of Dubrovnik. We’d heard that on top of the fortifications the sun can be intense and there were few shady places, so we slathered on sunscreen, donned baseball caps, and stuffed water bottles into our daypacks. Then we headed in the direction of the Stradun, the streets deserted at six-thirty on a Sunday morning. Or so we thought. As we turned the corner, the hum of excited voices filled the air. Unbeknownst to us, we were in for a sweet treat. Today was the last day of the Croatian festival of jams and jellies. The event is held in front of the Church of St. Blaise, and over thirty small producers exhibit more than a hundred types of jams, jellies, and marmalades: orange, fig, plum, lemon, cherry, strawberry, and other fruits, and in all possible combinations. And to add to the festive mood, all exhibitors dress in the costumes of their regions. As enticing as it was to linger at the jam and jelly displays, we wanted to beat the tourist crowds, so we continued on to the nearest ticket office at the Ploče Gate. There, we stopped briefly to photograph the dozens of cats and kittens waiting patiently for a woman to feed them. A few minutes later, we began our mile-and-a-quarter trek atop the massive stone fortifications that encircle the city. 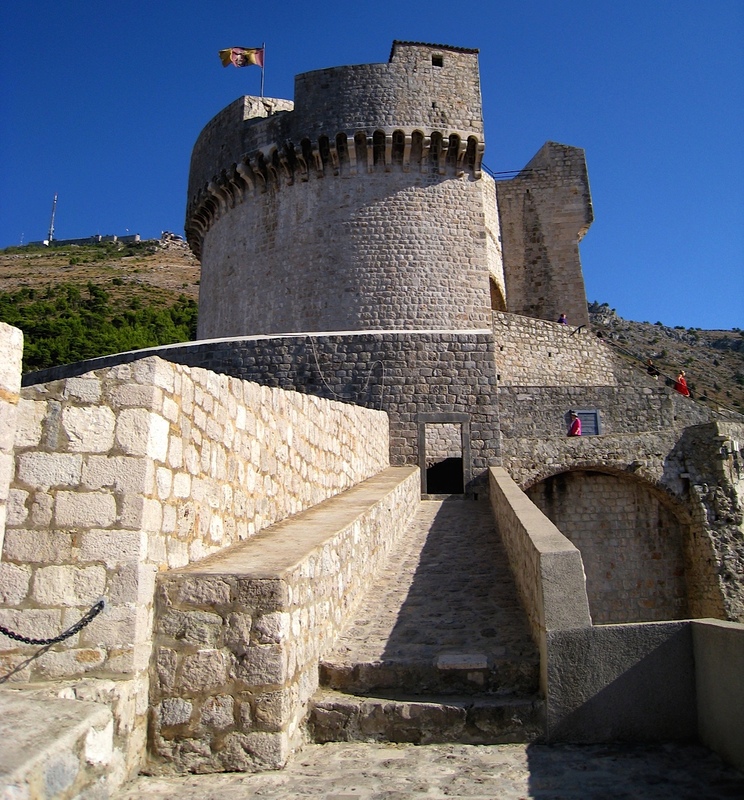 For almost as long as Dubrovnik has existed, so have the walls, which were beefed up during the fifteenth century because of threats from the Ottoman Empire. If you are interested only in speed-walking the wall, it can be done in an hour, or so we were told. However, we devoted the entire morning to the walk, interested in capturing all of the views and taking our share of photos. The day before, we had purchased a guidebook and therefore had a general understanding of the history of the City—with a capital C according to the inhabitants—and the construction of its walls. From our lofty perch atop the ramparts, there were magnificent vistas in all directions, and we paused to photograph every one. The first thing that captured my attention was the sea of reddish-orange roofs that stretched to the cobalt-blue Adriatic—a captivating visual. Upon closer examination, I noticed the difference in color between the older tiles and the newer bright orange tiles, replaced after the recent siege of 1991-1992. 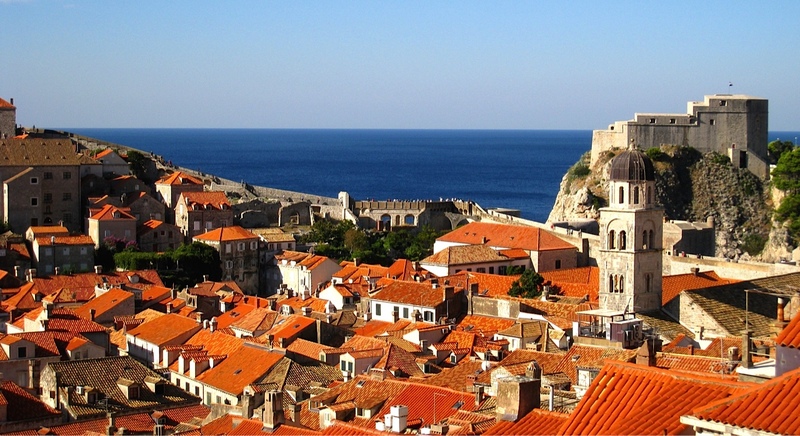 Although I saw a few damaged structures from the bombings and signs of buildings under repair, the City has made remarkable progress in restoring Dubrovnik to its original state. Engrossed in what it must have been like to man the city walls during a siege, I walked slowly along the narrow stone passage to the Towers of St. Lucy and St. Barbara, and then climbed to the top of the Minčeta Fortress for a panoramic picture of the Adriatic. At the Bokar Fortress, Dave stopped to consult the guidebook on the history of the walls, while I snapped photos of everything from the rooftops, to the sea, to arrow slits cut into the bulwarks, to cannons, and even the moat below the defensive walls—a total of over a hundred pictures on this morning alone. During one of these history interludes, I meandered to the outer edge of a wall and peered over the side into what looked like someone’s private garden; a peaceful, sun-dappled yard. Three walls framed the stone patio where a table and two chairs sat. On one wall, bridal wreath bushes in bloom hugged the crumbling stone. On the other a fuchsia bougainvillea sprawled across the enclosure, and on the wall closest to me thrived glossy-green trees. Of what kind I had no idea, until a soft breeze kicked up the clean, inviting scent of lemon. Then I saw the fading blossoms on the citrus trees. At the Tower of St. Mary, we took a water break. Here, on the highest point of the peninsula, was the site of the original settlement. As we closed in on the noon hour, the number of tourists had increased, and despite the posted signs telling wall-walkers to proceed counterclockwise, not everyone heeded the rule. However, a couple ahead of us sent a group of ten packing in the right direction, so we could make our way to the bastion of St. Margaret, then the Fortress of St. John, without dodging oncoming tourists. After our hike along the wall, which reminded me of my backpacking days but without the heavy pack, we had worked up quite an appetite. 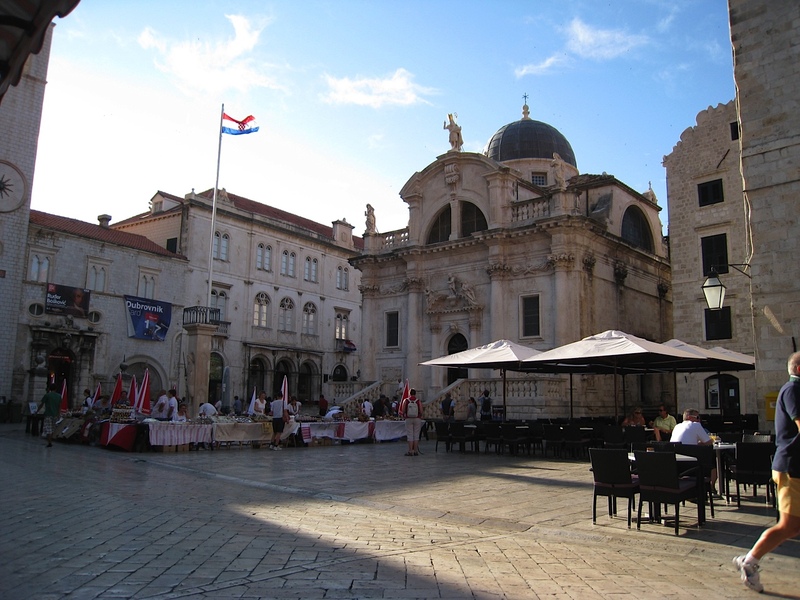 So back at street level, we cut through the Stradun from the Ploče Gate to the Pile Gate, on the lookout for a lunch place. At the gate, we had a rather lengthy delay as we waited for the cast of Game of Thrones to conclude shooting a scene. Finally, we crossed the Pile Bridge and immediately spotted Restaurant Dubravka 1836. More interested in giving our feet a short break than anything, we each relaxed with a glass of a local wine, ordered seafood salads, and ate our meals with four friends—pigeons—looking on. We returned to the Stradun at a slow gait, taking in the sights and the sounds of the jam and jelly festival as it wound down. On the steps of the Church of St. Blaise, a group of men appeared and serenaded the crowds, singing a cappella. Then church bells resounded throughout the City, an uplifting and moving experience. That night, we ate dinner at Restaurant Gallus, and the owner engaged us in a lengthy and informative conversation regarding the 1991-1992 siege. He apologized for interrupting our meal with his musings. We quickly responded by thanking him for this personal perspective on the harsh realities of war. He left us with these words: “There is nothing more precious in the world than freedom.” Next week, we board a bus for Split, Croatia. This entry was posted in Travel and tagged Author Pat Krapf, Croatia, Dubrovnik, Europe, Pat Krapf Texas fiction author, Texas Author Pat Krapf, traveling on February 19, 2015 by Pat Krapf. Oh! 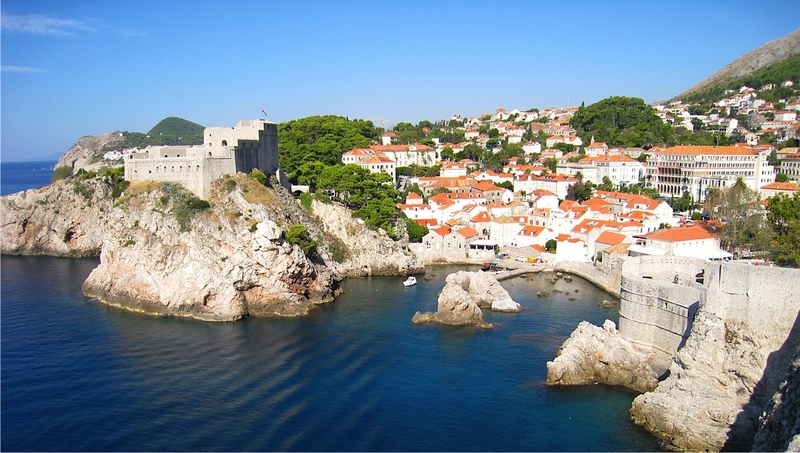 This post makes me so nostalgic for Dubrovnik. I was there in 1985, and it’s one of the few places on my travel bucket list that I’d like to revisit one day sometime. Thanks for the memories, Pat.